English soccer great Michael Owen appears on the new CNN Football Club show. He scored one of the greatest goals in World Cup at France '98, aged just 18, before going on to be named European Footballer of the Year in 2001. He has scored 40 goals for England and won seven major titles in 17-year career. 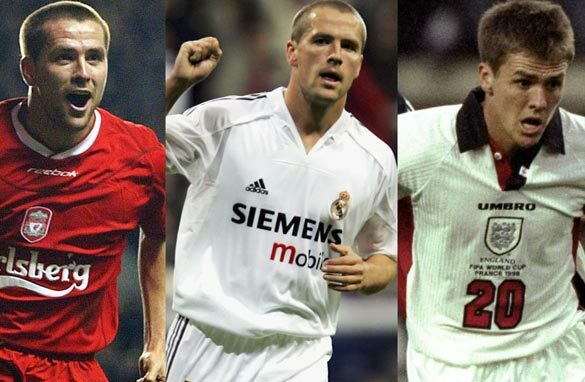 Now, former Liverpool, Manchester United and Real Madrid striker Michael Owen has answered your questions. Owen appears in this week's launch of “The CNN Football Club,” a forum for global debate around the UEFA Champions League which will be broadcast as a half-hour weekly debate show presented by Pedro Pinto and live 24/7 on CNN.com. To kick off this new soccer show, Owen joined Pedro to weigh up the blockbuster clash of European titans between Real Madrid and Manchester United. You can get involved in the show via our official Facebook page or @CNNFC Twitter account. This week our studio panel will have their say on United vs. Real, and we also want your views. Who will win the European Champions League last 16 tie? Let us know who will win the battle between Alex Ferguson and Jose Mourinho in the poll (right), and don’t forget to tune in when The CNN Football Club kicks off at 1700 GMT on February 7. This is Taiye from Asaba, Nigeria. Q) Do you regret moving to Real Madrid , while you missed out on winning a Champions League Medal with Liverpool in 2005? I ask this because you are yet to win this honour in your glorious career. Q) Do you plan to move to a team outside of Europe to promote the sport elsewhere like Beckham, Del Piero, Drogba etc.? Why didn't you stay longer in Real Madrid? Your way of playing would be perfect for Spanish football or did the injures got in the way? Did you regret leaving Liverpool when you saw Stevie G lift the Champions League trophy in May 2005 in what might have been the greatest final in football history? The match between Madrid and United will be a tough match. How can you compare the tactics between the two and the attacking force. What will be the difference between Mourinho and Ferguson. What went through your mind when you were injured during the 2006 world cup? Will you sign for Celtic before you retire? Big fan of yours, Michael! What I would like to ask is that, in 2004, was Gerard Houllier's departure a factor in your move to Real Madrid? We could see the excellent relationship and success you've had with the gaffer. Would it be any different had Houllier stayed on? Do you still see yourself getting involved in the three lions set up for the up coming qualifiers? Do you think the Coaching staff and Hodgson should give serious thoughts on bringing you into the fold given that you have been a magnificent servant to the England team? Which of your ex-teams will you support? Man Utd VS. R.Madrid. Q) If you could play on any Southamerican Squad....Which one would you choose and why?? My name is Rafael and I'm from Brazil. Owen, Have you ever watched Neymar playing soccer? Here in Brazil, he is being considered the best soccer player after Messi and Cristiano Ronaldo. Do you think he could be the best soccer player of the World in the future? what was the number 1 reason you moved from Liverpool to a starstudded team at Real Madrid knowing you were not going to start? Are there significant differences regarding team culture, training, etc. among those different clubs you played for / are playing for? Michael I was in Beijing when you and the England team were on tour...I noticed that you were the most popular player in China even more than Beckham...Do you have any future plans for China? (a) As a kid growing up, who was your mentor? (b) Given the chance, who would you name in a "Michael Owen all time starting eleven?". dat comment abt pluging c ronado in any club is true. Michael Owen is top quality striker. He needs playing time. Bench is not the place for him. He needs to be on the field and score those stunning goals his feet are used to. Why does he not look for a club out here in India one of those champion clubs of our I-League. We would love to see him in action at our grounds in Pune, Mumbai, Delhi, Kolkata, Goa, Gangtok, Shillong, Bangalore, Kochi, etc.